Omg! You guys! These flourless salted caramel cookies are amazing! I know I have said that with my 4 ingredient flourless chocolate cookies and my flourless chocolate chip cookies as well. These flourless salted caramel chocolate chip cookies take it to the next level. Can you believe they have zero added sugar? Yes you heard that right. No added sugar. You see, these cookies are naturally sweetened with dates. 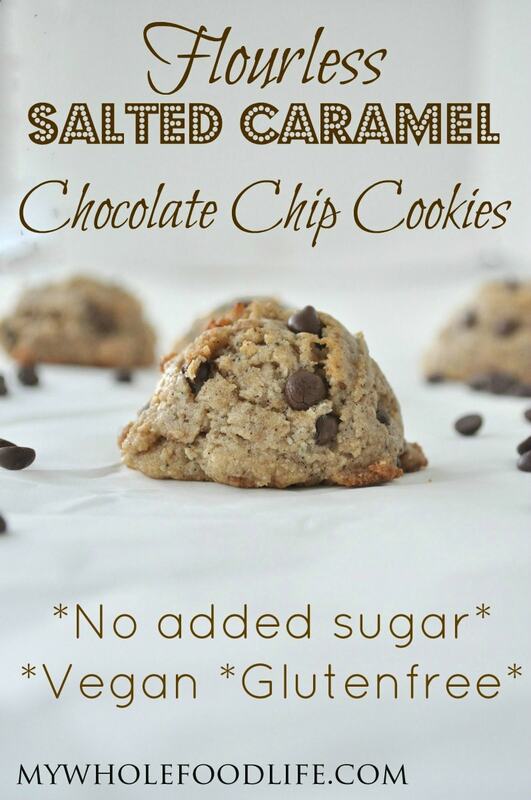 These salted caramel chocolate chip cookies are also vegan, gluten free and grain free. 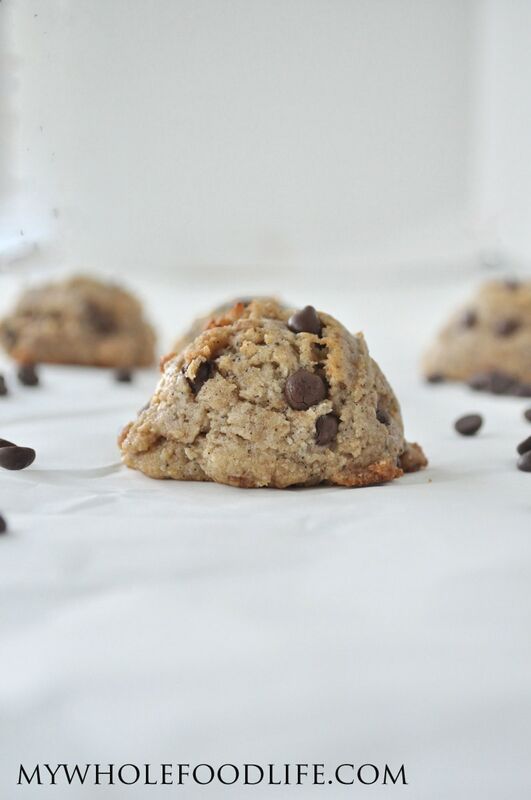 You will never guess these cookies are flourless with no added sugar! Drain the dates in the water. In a small blender combine the dates, sea salt and 2 T new water and mix until a caramel starts to form. If you need to add a little extra water, that is okay. In a food processor , mix the cashew butter, vanilla and baking powder together. Add the caramel to the cashew butter mixture and pulse a few times. Lastly add the chocolate chips and pulse a few more times. Drop cookies onto a lined baking sheet . I used a cookie scoop and got 9 cookies. Wait until the cookies are completely cooled before removing them from the baking sheet. Store cookies in an airtight container in the fridge for up to 2 weeks. You can also freeze them for longer. **You can buy cashew butter at the store, but you can also make it yourself in a food processor or high powered blender. Just take 2 cups raw cashew pieces and blend them for 5 minutes. Feel free to use another nut butter or even sunflower butter in place of the cashew butter, but keep in mind it may alter the flavor slightly. If choosing not to use dates and instead using raw sugar, what would the conversion be? Thank you!! I'm not sure that raw sugar would work in this since the dates help bind, but also provide the "caramel"
I have a daughter we are currently avoiding nuts...do you think that tahini would work in place of a nut butter (I know it would alter the taste). Some dark chocolate chips still have milk in them.